It has taken six years for this release to come to fruition since the group's formation in 2000, a period in which they have transformed from regulars on the West Country gig scene to virtual recluses. Locked away in the studio for a year and a half with producer Corin Dingley - one half of trip hop duo Alpha - the band must have been depressed on those cold, dark nights when the tracks just wouldn't come together and it shows with the results of their stay being at times throat-slittingly bleak. The whole album segues together into one extended dark soundscape with clear influences from past and present post-rock luminaries. Indeed the leanings go even further back on opening track, The Hills Have Eyes, with its very old school Pink Floyd psychedelic sound. It would have to be said that it is the element of psychedelia, be it through the use of keyboards or samples, constant throughout the album that stands Blueneck apart from the likes of Mogwai and Godspeed and gives them an identity of their own, something not easy to achieve in such a crowded genre. The links to these bands is undeniable however, especially in the threatening piano on the brooding Judas! Judas!, a track that slowly builds from a sparse landscape to one filled with those monsters that had been lurking around the corner since its beginning. 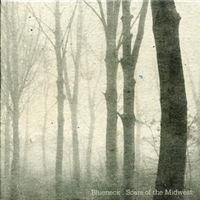 Around half of the tracks on Scars Of The Midwest are instrumental, the first to feature the breathy voice of Duncan Attwood though is the bizarrely titled Oig, another slow burner that transcends into a wall of sound. Meanwhile, the distorted vocal on the tranquil Le:465 is just beautiful, sounding just like an English Sigur Ros. Ub1 is Eno-inspired ambience and a chance to reach for the tissues before the tear-jerkingly depressing Epiphany, a track of epic proportions and one of the most emotional you are likely to hear in 2006. Samples are used to very scary effect on this one, distorted to give the impression of ghostly voices coming from your stereo speakers. The sonic effect during Ub2 is also quite something as the sound crashes around the listener like waves in a violent ocean, thanks in the main to Ben Green's soaring guitars. The stunning Amoc is the album's masterpiece however. By far the most uplifting track as lightly caressed drums are merged with vocal harmonies and atmospherics. Yesterday's Forgotten rounds off the album, a re-working of an early Blueneck song, stripped down with careful precision into a spooky finale for what is a fine debut effort for the West Country outfit. If we are lucky maybe they will come out of the studio and perform it live for us now.